A federal judge has barred Northwest Indian tribes from further participation in the Kennewick Man lawsuit by ordering the case limited to government defendants and the scientists who want to study the ancient skeleton. Tribes only need to make a request in order for identified funerary objects to be returned. But in many if not most cases, NAGPRA representatives from tribes say that litigation takes place. Kennewick Man in the northwest is a prime example. The Court of Appeals for the Ninth Circuit has scheduled an oral hearing on the Kennewick Man case for September 10, 2003, in Portland, Oregon. The hearing is scheduled for the late morning. It is our understanding that the Department of Justice and Joint Tribal Coalition will each have 20 minutes to present appeals. The Scientists will have a similar time to respond. --the final replay Joint Tribes will be posted soon. Thor has question about Kennewick Man. - Can anyone answer him? "My name is Thor. I had a question. Did Kennewick Man really have a Pewter knife on him when they found him? I have heard this rumour and I need to know if it is true. Or at least how I might obtain an answer to my question. PORTLAND -- Four Northwest Indian tribes have filed notice that they will appeal the ruling of a federal judge who rejected their request to rebury the ancient skeleton called Kennewick Man. [Reader suggests] "Inform yourself about mDNA research, read "The Seven Daughters of Eve." On page 320 of it, there is this: "Today about 1 per cent of native Americans are the direct descendants of Xenia." If an mtDNA sample can be secured from Kennewick Man, Xenia just might have been his Clan Mother. "The book's most complex and controversial find that the ancient European hunter-gatherers predominated over the farmers and not vice versa leads Sykes to another stunning conclusion: by chance, nearly all modern Europeans are descendants of one of seven "clan mothers" who lived at different times during the Ice Age." Will Science Lose More Ground? Ohio, Nov. 27 - The discovery of prehistoric tools from an Ohio cave is one of several finds that has scientists questioning the identity of settlers thought to have moved in 11,000 years ago. "Disagreement swirls around the timing of their arrival, the nature of their migration, how fast they moved across the landscape and their relationship to contemporary Native Americans," he said. Some scientists think that the earliest colonizers could have started out somewhere in Europe, not in Asia as previously thought. That idea is rooted in a rare genetic link called haplogroup X - DNA passed down through women that dates back more than 30,000 years. Recent genetic samples from remains in Illinois show that the rare European DNA was around centuries before European exploration. Today, haplogroup X is found in about 20,000 American Indians. TO THE PLANET OF THE APES 9,000 YEARS AGO FOUND. BURY HIM FAST, BEFORE ANYONE CATCHES ON. Recently, Secretary of the Interior Bruce Babbit cheerily agreed to let five American Indian tribes have the remains of the Kennewick Man, so they can bury these remains in a proper Indian ritual. The problem is that the Kennewick Man was probably a white guy and not an Indian. His skull isn't an Indian skull at all, but is the kind of skull that white people have. Why's that a problem? Because he was hanging around in America 9,000 years ago; long before any evil white people were supposed to have been here. The remains were found near the Columbia River in Washington state, and apparently there weren't even any Indians around there until about 3,000 years ago. The Kennewick Man is one of those inconvenient things that pop up every so often that cuts the legs out from various PC dogmatic truths. Suddenly, the Indians who have been claiming a moral high ground because "they were here first," have a rival. And, the rival may have been a white guy! "Oh, no, please don't let him have been a white guy," seems to have been the cry from the white haters in our nation. "Hurry and bury him, so the Indians can retain their moral high ground." So, although scientists want to do more testing on the remains to prove the Kennewick Man's genetic origin, the white haters won't allow it. An interesting thing about the Kennewick Man is that the reconstruction of his head, done from his skull, bears a striking resemblance to the actor Patrick Stewart who plays Capt. Piccard of the Starship Enterprise. In fact, the resemblance is so close that one is hard pressed to tell one from the other. Perhaps we need to look at Stewart's family tree to see if any of his ancestors disappeared from Europe while on a boat trip about 9,000 years ago, and maybe the remains should be given to Stewart to bury in Europe in a proper pre-Christian European ritual. 9-inches tall, and living in a dangerous world. family and community that cared for him as well. continent, and the kind of lives they lived. AFA Reactions to the Government's Report on K-man. Don't Let Them Bury Our Heritage! Euro-Tribe Continues Fight for Ancient Bones. Religious Group's Demands for Kennewick Man. The Left's malicious nihilism is impacting on every aspect of the nation's culture. malice, especially in the media. The mystery of Kennewick Man's missing thigh bones may have been solved. Detectives cleaning out the Benton County sheriff's office evidence vault on Thursday spotted a shoebox-size container, labeled simply "Columbia Park," in the coroner's cabinet, Sheriff Larry Taylor said. "The coroner basically didn't know what he had in his own little vault," Taylor said Friday. The pieces of bone in the cardboard box probably are from Kennewick Man, based on a preliminary examination, said Robbie Burroughs, an FBI agent in Seattle. An expert will study them more thoroughly and make a final determination. Then they will be turned over to the FBI, which has been investigating the disappearance of the bones since 1998. Conflict Between Native Americans, Scientists Could Be Settled PORTLAND, -- The conflict between American Indians' desire to respect the graves of their ancestors and scientists' curiosity about the origins of man comes to a head Tuesday over a 9,300-year-old skeleton. The scientists' briefs (filed 4/16/01 and 6/4/01) are now posted in the News area on the Friends of America's Past website. A link is posted to the government's reply (5/17/01). A Oral Hearing is scheduled for Tuesday, June 19, 2001 at 10:00 in Portland, Oregon at the Federal Court. A press conference will follow the hearing. We will post news as soon as it becomes available. PORTLAND, Ore. (AP) - Scientists who want to study the ancient skeleton known as Kennewick Man contend the Clinton administration improperly tried to prevent their research to avoid a messy debate over how the first inhabitants of North America arrived. The government allowed "inexcusable" contacts between White House staff and members of five American Indian tribes who sought to bury the skeleton, said documents filed in federal court Monday to support the scientists. The Interior Department decided last year that the nearly complete 9,000-year-old skeleton should be given to the tribes for burial. A spokeswoman for the Interior Department said the agency will formally respond in court on May 17, the deadline to file a response. But officials say they did nothing wrong. Read the current status, highlights of the case, and the questions before the Court. Read the original Court documents, press releases, and other news. News: The plaintiffs' file their brief. The federal government must produce raw computer data of CT scans done on Kennewick Man by next week after a ruling in federal District Court in Portland. The decision gives scientists access to data generated during government studies of the ancient skeleton - data that would be especially valuable to them if they never get to study the bones themselves. "It's potentially quite important," said Richard Jantz, computer analysis expert at the University of Tennessee and one of the scientists suing for the right to study Kennewick Man. "You should be able to see the interior surface of the skull, and you should be able to look at the sinus (areas). You should be able to see a lot of the details." ""I am pleased to announce that after careful examination of the human skeletal remains known as Kennewick Man, results indicate that the bones are older than Columbus and therefore legally Native American." The Solutrean Solution Did Some Ancient Americans Come from Europe? A frequent topic was the man known to Northwest Indians as "the Ancient One." Some scientists know him as Kennewick Man. They've fought for the right to continue studying his 9,300-year-old skeleton in search of clues about the origin of the region's earliest settlers. Judge reinstates lawsuit on origins of Kennewick Man PORTLAND -- After being on hold for four years, a federal judge has reactivated a lawsuit over a 9,300-year-old skeleton and questioned a Justice Department argument that any ancient skeleton by definition is that of a "Native American." What Meadowcroft suggests is that Paleo Indians from Asia came by land and sea in pulses of migration to North and South America, eventually winding up at the rock shelter. Adovasio, then a professor at the University of Pittsburgh, began excavation in 1973, and in 1975 published his first findings that people used the rock shelter 16,000 to 17,000 years ago. It was archaeological heresy. Until Meadowcroft, the oldest evidence of human existence in North America was found in Clovis, N.M., where artifacts were 11,200 years old. In Washington, discovery of Kennewick Man, a Caucasoid who lived 9,300 years ago, raised new questions about whether early inhabitants came from Europe. A Question of Race - Forensic Anthropologists Disagree About Racial Characteristics and Bone Structure A controversy erupted when anthropologists said the Kennewick Man resembled Caucasians more than American Indians. When an ancient skeleton was unearthed in the Pacific Northwest four years ago, some anthropologists said the skull didn't resemble modern American Indians, spurring speculation that Indians weren't the only, or even the first, people to arrive in the Americas. The 9,000-year-old skeleton, now known as Kennewick Man, died when he was 45-50 years old, according to a government study. His pelvis had grown over a 2-inch-long stone point embedded in his hip, perhaps giving him a limp. He also had suffered injuries to his skull and left arm, as well as broken ribs many years before he died. Scientists also took a close look at Kennewick Man's face. Some said the bones looked Asian. 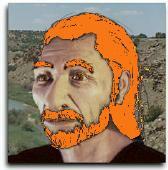 Others said they were Caucasian, or even Neanderthal. But just how much can the framework of the body tell about the person who lived inside of it? Based on measurements of the Kennewick skeleton, the National Park Service report states that the skeleton is biologically affiliated most closely with groups from Polynesia and the Ainu of Japan, a group indigenous to northern Japan who are physically different from most Japanese. Many archaeologists believe the Ainu are the descendents of a population that lived in many parts of south Asia thousands of years ago, and had some physical traits that are similar to Caucasians, such as wavy hair and thick facial hair. "The fact is, Caucasoid people used to be a much wider population," says Gill. "This can be seen in the Ainu of Japan. All of Japan, even just 3,000 years ago were bearded, white people." In a decision that could seriously impede scientific study of America's earliest inhabitants, Secretary of the Interior Bruce Babbitt has ruled that the bones of the 9,000-year-old Kennewick Man, discovered in the Pacific Northwest, must be turned over to five tribes of American Indians, who want to rebury them according to their traditions. Secretary Bruce Babbitt's endorsement of the Interior Department plan to repatriate the "Kennewick Man" to five claimant Indian tribes in the Pacific Northwest constitutes a crime against science. All parties agree on the rarity of the 9,000-year-old skeletal remains, the uniqueness of their location in the Columbia River basin of Washington state and the importance of their discovery. Known as the Kennewick Man, this middle-aged individual with a healed spear wound in his hip died an unexplained and lonely death more millenniums ago than humans were supposed to have occupied that part of North America, according to anthropologists. However, tribal oral histories hold that the ancestors of present-day American Indians, of which Kennewick Man is considered one, have occupied their traditional lands, close to where he was found, since the beginning of time. These oral histories and the geographic position they encompass are what Babbitt claims ultimately persuaded him to sign off on his department's decision to return the bones to the tribes for immediate burial in a secret location, precluding the possibility of further study. His decision is completely consistent with federal law. The Native American Graves Protection and Repatriation Act, passed in 1990, allows for such indicative evidence to provide the basis for determining cultural affiliation of human remains. Once a cultural affiliation is determined, repatriation must then be undertaken. While this law works remarkably well for recent or slightly antiquated human remains, it never comprehended a situation where truly ancient human remains are discovered. Thus, its application in this case distorts its intent. A strict interpretation of the law means that even ancient human remains like the Kennewick Man must be turned over to whatever tribes happen to currently occupy, or historically occupied, the area in which the bones were discovered. This is where legality and reality divide. Morphologically, Kennewick Man's physical features bear scant resemblance to modern American Indians, further stretching the realistic credibility of the Interior Department's cultural affiliation determination, even though it may be legally justified. Not only was he found in an area where there were no established Indian communities when he died, he does not even look like the people who claim to be his descendants. It is the equivalent of discovering the body of Moses in the West Bank and handing his remains over to the Palestinian Arabs because they occupy that area and their oral histories tell them that this was always the case. As for the hapless Kennewick Man, the matter now goes back to U.S. Magistrate Judge John Jelderks' federal District Court in Oregon. A lawsuit by a group of scientists requesting an injunction against repatriation was put on hold during the Interior Department's reconsideration of the matter. The scientist representing the Smithsonian in the group stated that he could count on one hand the number of skeletal remains as ancient as the Kennewick Man and that there was a wealth of information locked inside those bones. This motivated him to join his colleagues in a legal fight to at least study the ancient find before turning it over to the tribes for reburial. Hopefully, the judge will prove as wise as Solomon in his interpretation of the Native American Graves Protection and Repatriation Act and seize on the compromise of a limited study followed by repatriation. Losing the Kennewick Man back into the ground after such an exciting discovery without the prospect of learning what he has to tell us would be a tragedy of Shakespearean proportions. Michael J. Kelly is the director of legal research, writing and advocacy at Michigan State University, Detroit College of Law. New evidence reveals Vikings may not have been the first Europeans to land on Newfoundland. Kennewick Man's Last Stand Babbitt is trying to slam the door shut on this find. U.S. Giving Caucasian Kennewick Man To Red Tribes PORTLAND, Ore., -- Kennewick Man, one of the oldest and most complete human skeletons ever found in North America, is one step closer to returning to the earth -- and one step farther from the lab. The Interior Department decided Monday that the remains should be given to five American Indian tribes for reburial, disappointing scientists who had hoped to continue studying the bones. SEATTLE (Reuters) - The U.S. Interior Department on Monday said a controversial 9,000-year-old human skeleton found in Washington state belongs to five Indian tribes who say he is an ancestor who should rest in peace rather than be studied by scientists. DNA tests failed to fix the racial origin of the skeleton, dubbed Kennewick Man after the town in southern Washington state near where it was found in the Columbia River, leaving geography and tribal folklore to prove the bones should go to the Indians, the agency said. ``Our investigation was to be a searching one and we have left no stone unturned ... that would cast light on this issue,'' said John Leshy, U.S. solicitor of the interior, in a teleconference with journalists. A group of eight scientists had sued to stop the Indian tribes from claiming the 380 pieces of bone because tribal representatives vowed to rebury them, precluding further study on one of the earliest known human skeletons in the United States. An attorney for the scientists, Alan Schneider, vowed to appeal should a federal judge in Portland, Oregon, back the government's decision to award the tribes the bones. Federal attorneys say testing will continue to 9/24 deadline. Three laboratories conducting DNA tests on Kennewick Man are struggling with the complex procedure. In a report filed Friday in U.S. District Court in Portland, federal attorneys said the labs had not been successful in obtaining DNA from tiny bone samples taken from the 9,300-year-old skeleton four months ago. The DNA tests are being conducted to determine whether Kennewick Man can be linked to modern Native Americans. The labs -- selected by the U.S. Department of the Interior -- are at Yale University, the University of Michigan and the University of California at Davis. The attorneys stated that the genetic-testing efforts would continue for another week to 10 days. They said that regardless of how the tests turned out, federal officials would make a decision by the court-imposed deadline of Sept. 24 on whether eight anthropologists could study the remains. The anthropologists sued the federal government 3½ years ago seeking to conduct a complete study of the bones, which they say can provide valuable information about life long ago in the Northwest. Five Columbia Basin tribes that have filed a claim to the remains are opposed to additional testing. They say the remains are those of an ancestor and need to be reburied. U.S. Magistrate John Jelderks put the scientists' lawsuit on hold in June 1997 and ordered government officials to assess whether the anthropologists could study the remains. The tribe's request to be named co-defendant in a lawsuit is denied. A federal judge in Portland says he won't allow the Yakama Nation to enter the 3½-year-old legal dispute over the ancient skeleton called Kennewick Man. S P O K A N E, Wash., Aug. 8 - A federal judge has denied the Yakama Nation's motion to intervene in the long-running legal battle over the 9,000-year-old Kennewick Man skeleton. Magistrate Judge John Jelderks ruled that the central Washington tribe waited too long after the lawsuit's filing 3 /12 years ago to try to join the federal government as a defendant. The Yakamas filed the motion to intervene in May, along with a counterclaim declaring they are "culturally affiliated" with the remains and entitled under federal law to custody of the skeleton "for traditional reburial." Jelderks, who issued a written ruling last week from Portland, Ore., said he was concerned that adding the Yakamas "would further delay a process that has been less than expeditious, and would be prejudicial to the parties' interest in efficient and timely resolution of this litigation."